Canford Chase resident John Griffiths is living proof that age is no barrier when it comes to raising cash for Sport Relief. 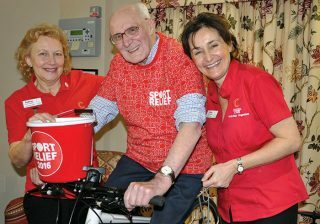 The 87-year-old did his bit for this year’s charity appeal by joining an eight-hour, in-house cycle relay. He joined 30 team members, volunteers and guests who each cycled a 15-minute individual session. 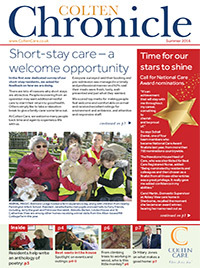 Other Sport Relief activities at our homes included a ‘mini Olympics’ challenge at Avon Cliff in Bournemouth. Cups and medals were awarded for points scored in skittles, target bowls, indoor golf and beanbag distance throws. At Woodpeckers in Brockenhurst, Activities Organiser Jane Bunker raised more than £200 by dressing up in dozens of sports-related clothes and items of kit and completing a sponsored run round the home’s garden.